Easily one of my favorite books. And I look forward to seeing Julia Roberts play Elizabeth Gilbert in the movie version opening today. IMO, there is just something enchanting about Julia. Also, as Cheslea Handler said in her monologue the other night (anyone else watch Chelsea Lately? ), we'll finally stop seeing Julia stuffing her f*ing face with gelato everywhere we look. LOL. 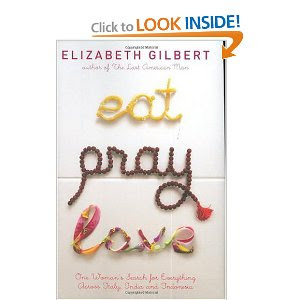 Beyond that, I think Elizabeth's writing is inspirational. "People tend to think that happiness is a stroke of luck, something that will descend like fine weather if you're fortunate. But happiness is the result of personal effort. You fight for it, strive for it, insist upon it, and sometimes even travel around the world looking for it. You have to participate relentlessly. Isn't that like an ADULT BOOK!!!! (okay, I know that's a question). I might see the movie at some point, tho. Stina, I know, SHOCKING, right? I am really glad you posted about this book. I really want to read it and now I think I'll go grab it today! EPL was such an amazing book! I remember that last quote; it's one of my faves from the book! I hope the movie is just as good! From the previews, Julia Roberts seems like she was cast perfectly. I'm reading this book now, because I'm definitely going to see the movie, and I'm loving it! Great quotes. It's such an inspirational story. I love this book! And...did you see that Chelsea Handler is coming to the Q? That would be an awesome show! Isn't Maddy the best? I just completely adore her! I haven't read this book yet. I need to. I have heard so many people love it. I would like to see the movie for sure! Hope your weekend is wonderful. Thanks so much for coming over to Maddy's interview! The story behind this is pretty cool too. I mean she somehow got the publisher to pay an advance big enough for her to travel the world for a year ... AND WRITE ABOUT IT. Awesome. Today's guest blogger is Ted Cross! Thanks for sharing your fav quotes from EAT PRAY LOVE. I read it a few years ago...it's fab. Enchanting is a great word for Julia Roberts. I want to see this movie. I haven't read the book yet. I don't read much anymore....sad isn't it. i love those quotes!! i'm excited to see the movie, it looks so good! I'll be honest. I haven't read this book. People keep saying I should but I haven't. These quotes make me want to read it SOOO badly. Thanks christina. Sounds wonderful... my daughter is dying to read it!! I think I'm going to see the flick first, but I can't wait to read the book! I think she is a fantastic actress...can't wait to see the movie. I so wanted to love EPL and didn't. I'm sorry. Can we still be friends? Yeah, I'm too busy reading this other AWESOME book some wonderful blog friend recommended...THE SKY IS EVERYWHERE. I've been wanting to read this for a while...might have to do it sooner rather than later. I'm looking forward to the movie, too! First of all - I want to say thank you for stopping the interview :) It means a lot to me! The book was brilliant, the movie was brilliant! I loved it and can't say enough good things about it! Reminder - Guess that Character Blogfest is this Thursday and Friday! Look forward to describing your character! EPL is my favorite book ever. I remember every one of those quotes. And no, I haven't seen the movie yet, but I will, soon! I haven't read this book yet, its on my list, but after seeing these quotes it needs to be moved further up! All 3 are so true! I really enjoyed it too. It took me a little while to get into it, though. I still have not read this! Our local bookstores keep running out of copies. My husband watches Chelsea Lately so I have seen a few of them. I saw the movie last night and I loved it. Interestingly enough I received a free copy of this book yesterday after helping out at my daughter's middle school Scholastic Book Fair. Turns out they offer a small selection of adult books too - probably for the teachers. The librarian and the drama teacher also snatched up copies. Then I had a long talk with the drama teacher about how the book's message of finding balance in your life really resonates with her. This book is a perfect example of how something simple but heartfelt and targeted towards a specific market segment can catapult a writer to fame and glory.